I saw this cake on YouTube. I searched around for different recipes and the fact is, they are almost all identical. I hear this is an old recipe from back when, but never have seen it or had it before. I made this cake twice. The first time I refrigerated it as instructed upon it cooling to room temperature. The second one, I just cooled to room temperature. Everyone loved the one I put in the fridge more. It fell a little more than I thought it should have. They loved the second one, but the first one was their fav. Here is why I did it twice. I couldn't very easily see the layers in my first cake, as every photo shows. You could easily taste the textures of the different layers but just not see them. Then I decided they were probably photo shopped, and just made the second, with all I had and decided it would be one I would photograph and use. I am still not sure you can SEE all the layers but I assure you, they ARE there! This 1 batter, 3 layer cake, has a dense layer on the bottom almost in a crust sort of fashion, then a vanilla custard layer and then the top is a light, sponge cake like cake layer. So long story short, this was a huge hit! I hope it is for your family and friends as well! Preheat your oven to 325 degrees. In a clean bowl, with clean beaters, beat the egg whites to stiff peaks. Set aside. In another bowl combine egg yolks, water, and sugar. When well combined, add in vanilla, melted butter and all purpose flour. Keep beating until well combined. Add in milk and again beat until all ingredients are mixed. They will be a VERY liquid batter. Now carefully fold in your egg whites. It is OK if there are a few lumps left, just do the best you can. Pour into a 9 inch round cake pan, (greased ) and bake for about 1 hour. The cake should still be SLIGHTLY jiggly in the center when it is done. Let cool until room temperature and my suggestion is to refrigerate for a couple of hours at least, then sprinkle the top with powdered sugar! 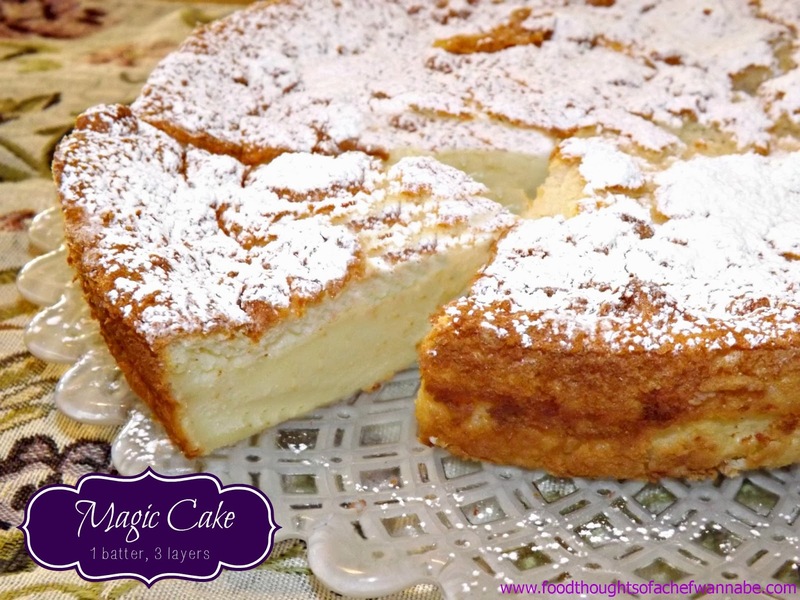 Enjoy this magical 1 batter cake that gives you 3 layers of sweet goodness! Looks completely yummy. And yes, you can see the 3 layers! Yes, if you look closely you can see the three layers! It sounds delicious, I'll have to give it a try, thanks! ok, this looks SO yummy!! but do you invert it onto a plate and sugar dust that? or flip it back and dust?